Many of Trump’s supposed job creation achievements have involved Asian companies. Soon after the election Trump claimed that Japan’s SoftBank had promised to invest $50 billion in the United States and create 50,000 jobs. Soon thereafter, Trump and Chinese mogul Jack Ma vowed that the latter’s Alibaba e-commerce empire would create 1 million U.S. jobs. In June, Samsung said it would open an appliance plant in South Carolina. More recently, Japanese automakers Toyota and Mazda said they would jointly build a $1.6 billion U.S. assembly plant with 4,000 jobs. 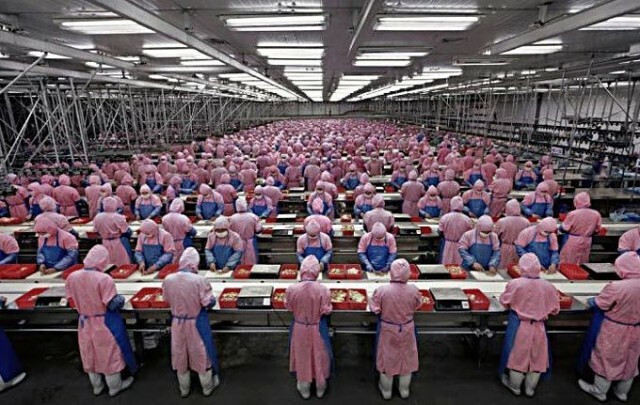 With the blessing of the White House, Taiwan’s Foxconn announced plans for a $10 billion flat-screen plant in Wisconsin (probably in the Congressional district of Speaker Paul Ryan) that would purportedly employ up to 13,000 people. Foxconn is reported to be considering another plant in Michigan. While these announcements are presented as a boon to American workers, there are reasons to be cautious. Companies such as Foxconn have made big promises in the U.S. before and failed to deliver. It and SoftBank and Alibaba may be simply currying favor with Trump and will be unable to make good on their extravagant job-creation projections. Their main aim may be to discourage some of Trump’s more aggressive protectionist tendencies. What happened in Canton is nothing new. For the past three decades, Asian and European automakers have been opening U.S. assembly plants, focusing on states with low union density and a political climate hostile to labor organizing. Taking advantage of their non-union status, they have made excessive use of contingent labor and weakened the ability of workers to act collectively to improve their conditions. Trump, of course, launched no tweet storms against Nissan and expressed no support for the workers in Canton. On the contrary, for a supposedly populist president, Trump has promoted a series of anti-worker policies. These include moves to shift the National Labor Relations Board in a pro-employer direction, reverse the overtime pay reforms adopted by the Obama Labor Department and weaken workplace safety and health rules.